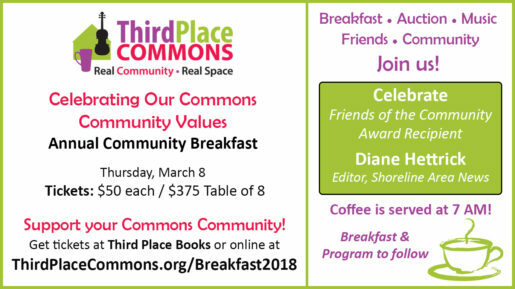 Third Place Commons invites you to join us in Celebrating Our Commons Community Values at our annual community breakfast on Thursday, March 8th. ​This lively, fast-paced event is our biggest fundraiser of the year and is the perfect time to join with friends, colleagues, and neighbors in showing your support for the extraordinary community that is fostered here at the Commons and at the Lake Forest Park Farmers Market. We’ll be spicing things up with a live auction featuring some fun, very cool, and unexpected items. And of course, the wonderful Milner Family Fiddles will be on-hand to serve up a warm, musical welcome to one and all. Each year at the breakfast, one of the high points of our event is when we present our Friends of the Community Award. And what better way to celebrate these values than by honoring this year’s Friends of the Community Award recipient Diane Hettrick, editor of the Shoreline Area News. Diane has given tirelessly to the local community for many years as the daily editor of the widely read local news source that has proven an invaluable resource to local individuals, organizations, businesses, and civic partners throughout Shoreline, Lake Forest Park, and beyond. Next Post: Meet Breakfast Speaker Ron Chew!